A report published by Barnet Council reveals that Chief Executive Nick Walkley is paid a basic wage of £200,000 a year - £20,000 more than the salary paid to his predecessor Leo Boland, and more than Prime Minister Gordon Brown is entitled to receive. Mr Walkley’ s deputy, Brian Reynolds, is paid a staggering £180,000 a year - no doubt as a sop for missing out on the top job. It is worth remembering that Mr Walkley was Barnet’s Executive Director for Resources when £27.4 million of taxpayers money was deposited in failing Icelandic banks and the Aerodrome Road bridge project went £11 million over budget. To reward him with a basic salary of £200,000 (plus pension) is grossly offensive to Barnet’s hardworking taxpayers - many of whom have lost their jobs in the recession. In December 2008, the then Shadow Community Secretary Eric Pickles announced that the next Conservative government would purge the fat cats from Town Halls and Officers earning six figure salaries would lose their jobs. In 2002, when the Conservatives won control of the council from Labour/LibDems, the Chief Executive was paid £113,100 a year - a salary which most people would still consider very generous today. Yet despite the Conservative Party’s clearly stated policy with respect to chief officer pay, Barnet’s ruling Tories are happy to keep splashing the cash with absolutely no regard for the taxpayers who have to pay the bill. I'm rather intrigued, not so much by the CEO's salary, but by all of the rest of them. Assuming they weren't all earning more than Leo Bolland and many of them have been in situ for ages, what has been the average annual pay rise under the Tories? I wonder how many sheltered housing wardens we could afford if they'd all got the same level of pay rises (or even double the rate) that dustmen got in the same period? I wouldn’t object to big pay rises if they were performance related, but as the Conservative Party spokesman rightly points out, it seems as if figures are just plucked out of thin air. 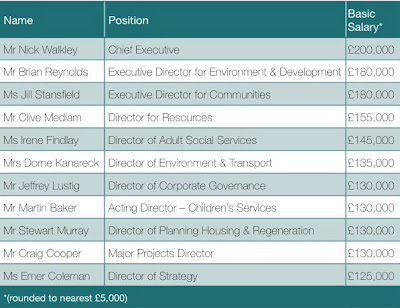 Why are Barnet’s councillors not standing up for residents and keeping these obscene salaries in check? We, the people, have never been consulted over these salary levels. We have never been consulted as to whether we are happy with the performance of the chief officers. Fred, it's a piece of pure theft. These fuckers should be taken out and strung up. If you think the Tories will do anything you are badly mistaken. They are in it for what they can get too! Part of the problem is that elected councillors have their snouts so deep into the public trough that they don’t care when unelected council chiefs do the same. Indeed, I suspect that it is all part of a mutual back scratching exercise. In Barnet the independent panel suggested that councillors might like to consider reducing their allowances by a measly 1%. This was rejected outright by councillors. Indeed, the leader of the LibDems stated that if councillors took less money, the public would think they weren’t working as hard. Yeah, right!!! Is replying to a comment on your own blog blogging?